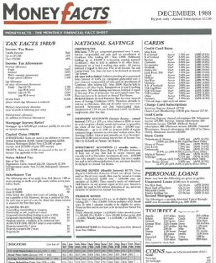 Moneyfacts started life in 1988 as a six page financial fact-sheet with a revolutionary idea: to bring the best financial products together in a way that allowed for comparison. Since then much has changed at Moneyfacts, but we are still committed to our founding company values of accuracy and independence. Balanced editorial we write in our news section. Depositor Protection Schemes to find out where your bank or building society is licensed, and what deposit protection guarantees you'll get if they go bust. moneyfacts.co.uk is a business. As a business, it's important for us to make money, so that we can continue to provide our site for free use. However, as a business we also take an ethical approach to the service we offer – this is at the core of what we do. We show all the products available to you in our product searches, with the better ones appearing in our Best Buy tables. We do not get paid to show any of the products you see on the site (unless in an advert), nor do we receive any payment to include a product in our Best Buys. Although we don't get paid to include products in our searches or Best Buys, some companies choose to pay us for any clicks, applications or sales they get by enquiring through moneyfacts.co.uk. It's easy to see which products that are in a best buy chart we make money from: wherever you see the “go to site” button that means we get paid either because you click the button, make an application, or buy the product. Some parts of the site show a green "Speak to an adviser" button. From this you can arrange to speak to an adviser, and we will get paid by them if you take an account out following their advice. When you conduct a product search, your results will default to the products that are “available online”. These are, in other words, the products that have a “Go to Site” button – the products we make money from. You can still apply for other products online that are in our search results (as long as the provider allows this): you just can't do that directly from moneyfacts.co.uk. If you complete a contact or quotation form that is sent to one of our selected third parties, we get paid for supplying them with your business. We also earn money through companies advertising on our site. We get paid depending upon how many times an advert is shown, or is clicked on by visitors. Read more about the moneyfacts.co.uk best buy promise or meet the team behind moneyfacts.co.uk. For mortgages, savings, banking, credit cards, personal loans, investments (unit trusts, investment trusts, with-profit bonds, pensions and annuities) and life insurance we cover the whole of the market (in practice it isn't possible to cover every single product from every provider so we aim to include at least 95% of providers). We always include all the main providers in the UK and look to include overseas banks operating in the UK where these are actively targeting UK consumers. The companies we don't include tend to be small regional building societies or overseas banks which only offer services to limited markets in the UK. For other insurance products and secured loans our service is based on a fair representation of the whole market. We have a large team of in-house researchers dedicated to the collection and maintenance of financial information over a wide breadth of product areas. However, in order to provide you with a complete service, we've made arrangements with some third parties for areas we don't research. Moneyfacts aims to offer the highest quality of product information, guides and service to our customers. However, if you have cause to make a complaint about anything we have done, please email us using our Contact Us function, and mark your communication as ‘I’d like to make a complaint’ as your chosen subject. We aim to deal with any complaints as soon as possible and hope to respond in all cases within 5 business days, either with an acknowledgement or a resolution. If your complaint is significant enough to be classified as a regulated complaint using the definition provided by the Financial Conduct Authority, you will have the right to refer the matter to the Financial Ombudsman Service if you are not happy with our resolution. We will confirm to you when we acknowledge your complaint whether we are treating it as a regulated complaint. moneyfacts.co.uk is operated by Moneyfacts.co.uk Limited which is authorised and regulated by the Financial Conduct Authority (FCA). Our FCA permissions allow us to introduce you to other regulated firms, but not to sell products direct or give advice. The products we deal with such as investments, mortgages, personal loans, credit cards, overdrafts and insurance products are regulated by the FCA. FCA don't regulate utilities or most business services. For domestic and business utilities service our preferred supplier, Love Energy is fully accredited to the Confidence Code to compare energy for domestic customers. For our broadband, home phone and digital TV service our preferred supplier, Broadband Choices is fully approved by OFCOM, providing quality assured calculations of price comparisons for fixed line, mobile, broadband and digital television services. Please Note: Some of our above providers will send you 3rd party information. If you do not wish to receive this correspondence please deselect the 3rd party information box within the forms.